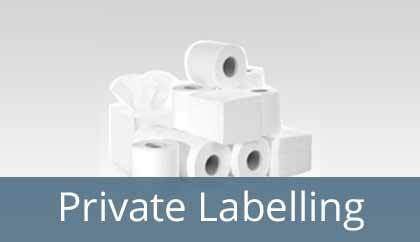 An all-encompassing and Omni present brand name is one which makes all the money, this means that when you want to spread the name of your brand by obvious as well as subtle means, get in touch with us at Lotus Tissue Paper Products and see yourself adopting an innovative marketing and advertising strategy with our private labeling service. With this service, we provide you with a unique platform for advertising your brand by printing your logo, trademark, tag lines or all, on our products of your choice. This innovative strategy in taking the name of your company forward, helps us in serving you better. With the range of high quality, soft and custom printed tissues , you can reach literally into ‘the pockets’ of your clients and also take an opportunity to make them comfortable in the process of building a base for yourself. With our capability to provide you with colorful and designer tissues, we feel proud in being called your ideal advertising partner.